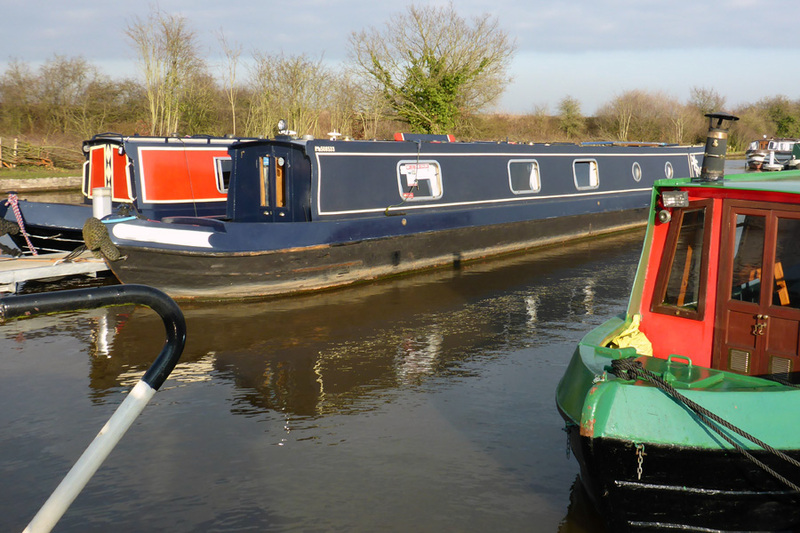 I am pickled tink – in the process of buying my #narrowboat home – The Diesel-Electric Elephant Company. Went over to the Bro’s in Cheshire last week and on Wednesday decided we’d pop out for a mooch around a couple of boatyards just to see what’s what. Stepped aboard the first boat from my “to see” list and promptly began the process of buying the wee beastie. Stuck a deposit down there and then (using the bro’s credit card, thank you Bro)! It’s a bit like buying a house – offer, negotiation, survey, contracts – and should take about six weeks to complete, assuming that the survey finds no horrors. This one felt solid and friendly from the first, has 6′ 6″ of headroom (handy when you’re 6′ 2″ on a good day) and ticked all of the boxes regarding layout, engine (Isuzu diesel, 38hp), gearbox (hydraulic, PRM150), shower (proper cubicle, no icky curtain jobbies), kitchen (minimal, splendidly simple), Victron inverter/charger (good capacity), new(ish) batteries and on and on… The blunt end is a “semi-trad” which suits me just fine – a halfway house between an open cruiser deck and the less-friendly/sociable fully trad. The back is somewhere to get out of wet and muddy clobber. The sharp end is chunky and businesslike (and just needs a cover). The interior wants for a spot of wood flooring to replace the carpet, some carpet installing on the sides up to the gunwales and some wooden venetian blinds to replace the curtains. The “dining” area is not to my joy but it is in the right place to be easily half taken away and half replaced with a proper desk/study/working area. Somewhere to get my finger out and to come up with a few canal-related stories too… This on top of publishing The Dog With The Bakelite Nose in the next couple of months! Interwebnet access will be by dint of Huawei gizmo, booster aerial and England’s somewhat capricious mobile PAYG network. Gawds alone know what a chap does about post, prescriptions, NHS quacks, dentists and so forth. I’m sure that something will occur. Now, I also need to arrange to be adopted asap by a hound from a rescue home, preferably a big butch mutt that’s au fait with tiller-work, ropes and putting knots in boy scouts. One that can perform man-overboard procedures when I fall in, is experienced with a VHF radio, cleans for fun and makes decent coffee. We also need a new name; the boat’s current name is not one that appeals. I suppose that this will involve officialdom, a small bucket of paint and a large bucket of champagne over the bow. Will probably get Canterbury and a couple of other denominations to mutter a few maritime words, that sort of thing. Maybe a fly-past from the Red Arrows and then let off some Chinese fire-crackers. The current list of contenders for a new name include “Porterhouse Blue” (Tom Sharpe reference); “Poonah in ’43 or ’44”; “Darjeeling Station” and “Cardinal Wolsey”. Still thinking, no rush. I have decided to award myself the rank of Admiral, so that makes me Major-General Wing-Commander Admiral Sir Hutson D.S.O., D.D.T., I.T.V. & Vitamin B by The Bar. Any more and I’d have to have fold-out business cards, so it makes sense for the moment. Let the exploration and inspection of the English canal system commence – lots of aquaducts and long tunnels to be braved, locks and connecting river stretches to be mastered. This bearing in mind that (at the moment) I can’t swim a stroke and some of my worst recurring nightmares are deep-water related, thus proving beyond doubt my absolute insanity. Sherry and warm cherry cake on the poop deck, soonest. Have I mentioned that I am tickled pink, quite beside even myself and jumping up and down with the need to shout HUZZAH! every five minutes? Well, I am. Fingers crossed. Chin-chin. My wife & I considered one some years ago but the mooring costs on the Thames were the problem. Still like the idea of one when I walk along the Kennet & Avon canal which is no so far away. Like the name Porterhouse Blue, Read the book so if you go for that name you have to have a Tom Sharp painting on the side. Enjoy you never know you might find a photo of your boat on my blog some time if I see it. You sound just a little pleased by your purchase Ian. I hope the survey goes through well. I’d be tempted to see if I could get to Cheshire and find you by looking out for a boat called the Huzzah Porterhouse Wolsey and with an Irish Wolfhound sunning itself on the roof . Your local swimming baths probably does lessons for adults which are quite small and away from the prying eyes of kids. I need to find somewhere very private and very quiet where a chap my age who is thoroughly embarrassed about not being able to swim can learn! I was almost there at school and suddenly the pool was closed, we moved to another area and the matter never arose again. It’ll be waterwings until I learn! Ian, get that eye-patch and jolly roger now – oh, and a captain’s hat too. She looks beautiful. What does it cost to keep such a lovely thing in a marina with services (electric, water, gas, etc) where you plan to keep her and live-aboard. Most of all, congratulations on a wonderful decision. Bill and I lived aboard for five years and loved it. Stillroamin? Old Blighty? The SS Jerome K. Jerome? Jolly nice boat, lad, with a ruddy good rudder. What splendid news! I think I should be as thrilled as you are if it were me buying a narrowboat. I am looking forward to hearing what you name the old girl and then for stories from the towpath. Your excitement practically leaps from the page. Watch the old ticker or you may have man overboard! We are deeply envious and will be shadowing you like a German U Boat to see if a life on the ripples might work for us too. Huzzah! is not a bad thought for a name – added to the list of contenders, thank you! A tent on the cabin roof mayhap will be comfortable guest quarters – or a luxurious rowing-boat towed behind… 😉 I was considering going to Condition Tickled Taupe, but it would have meant changing the bulb. Splendid boat. I hope she stays afloat Admiral! Watch out for rats going missing. Rats in the bilges? I suppose I should shove a cat or two down there, just in case… 😉 All I can say is that the Spanish armada had better look out.